On all Southern Crossings tours airport/dock transfers, domestic flights and entrances to sites are included. Depart any day on a Lake Titicaca Islands tour and customize your Peru tour at no extra charge! We are family tour specialists. Add on: Nazca Lines, Amazon Rainforest, Colca Canyon, Sacred Valley, a Pacific Beach Getaway, free days or extra activities. This eight-day tour in Peru takes us to the Sacred City of Machu Picchu as well as on a Lake Titicaca islands tour. On this tour we’ll cruise across this highest of navigable lakes and visit the floating islands and the islands of Amantani and Taquile, where native ways and traditions have changed little in the past 1000 years. Day 3: Machu Picchu tour. Day 4: Journey to Lake Titicaca, visiting Raqchi ruins, Andahuaylillas church and the Pukara Museum in route. Day 5-6: Lake Titicaca islands tour. Floating Islands and islands of Taquile and Amantani. Day 7: Flight to Lima and city tour today if not on day 1. A short flight brings us to the famous Inca city of Cusco. After checking into your hotel, we set out to explore the incredible capital of the Inca Empire. We head to the picturesque Plaza de Armas to the cathedral to see the colonial influence in the city, and we can admire the stunning architecture of the church and also the native influences subtly woven in into the artwork. Onwards to Qoricancha church, where the colonial and Incan architectures are on display side-by-side directly contrasted with each other. Afterwards we make our way above the city to the imposing fortress of Sacsaywaman where we can marvel at the incredible stonework and architecture of the Inca civilization. We head back to Cusco in the late afternoon. A beautiful early morning train journey across the high plain above Cusco then down the Urubamba Valley to majestic Machu Picchu. Known as one of the greatest architectural achievements in the world, this historic sanctuary is considered one of the seven manmade wonders of the world. After a guided tour, take time for independent exploration of this magnificent site. Return by train and car to Cusco in the evening. This morning we head down to Puno on a guided bus tour. The trip there is beautiful, as we pass by Andean villages, herds of llama and alpaca, and high snowcaps. We stop at the Inca site of Raqchi, the old colonial church at Andahuaylillas and the Pukara Culture Archaeological Museum. 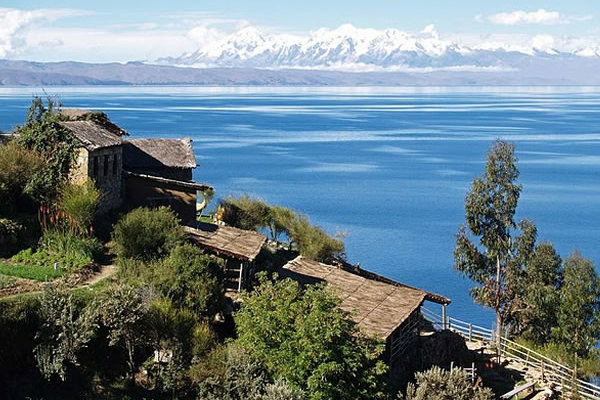 We arrive on the shores of Lake Titicaca, the world’s highest navigable lake at 12,500 feet above sea level and get to relax before your Lake Titicaca tour of the lake the following day. Boats are the transport theme today as our Lake Titicaca islands tour begins and we head out across the water. Our first stop is the islands of Uros, completely constructed out of totora reeds and floating on the surface of the lake. We’ll take a walk across the spongy surface of these unique islands and go for a ride in a reed boat before continuing on to the island of Amantani, where we’ll spend the night with a local native family. A soccer game with the locals, an amazing sunset, and a music and dance fiesta in native garb are all on the agenda on Amantani today. Please note: our Lake Titicaca family stay is a truly authentic experience which includes being cooked for by and dining with the local family and staying in a room at their house. There is often just candlelight, no electricity, and the bathroom is an outhouse. This is a great experience which is the highlight of many people’s trip, but which can certainly be described as “basic” , “authentic” and “roughing it”. If you do not wish to spend the night on the islands, Taquile and the Floating Islands can be visited on a day trip. This morning we head to the island of Taquile as our Lake Titicaca islands tour continues. The native culture of Taquile is the most intact in probably all of the Andes, with its inhabitants maintaining the same customs and dress as they have for over 1000 years. Taquile Island is famous for its textile art that has been declared a UNESCO masterpiece of oral and intangible heritage of humanity. You will truly feel as though you have gone back in time as you walk the ancient stone paths of the island and observe its people. Afternoon boat ride back to Puno. After a morning flight to Lima, we’ll have the day free to enjoy the capital city’s many sights, including the Presidential Palace, the catacombs beneath the San Francisco church, and the National Archaeological Museum. Departure day. Your flight can depart anytime today. A transfer to the international airport is included. Peru: Islands Express is an eight-day tour which includes a family stay on your Lake Titicaca tour, high-altitude walks of 30-45 minutes. The rooms with the family are twin-share and clean, but also very basic, often with no electricity and always with the bathroom outside the house. It is possible to visit the Islands on a Lake Titicaca Islands tour day trip if you would prefer or to upgrade to a 4 star hotel on a different island. The trip also includes walking around ruins and during city tours. As always, a certain patience is required for the inconsistencies and occasional delays of developing-world travel. Puno – Lake Titicaca islands tour: similar to Cusco with stronger sun and colder nights. Expect to spend about US$5-12 on a meal, US$2 on a beer, water or soft drink in Peru on the Lake Titicaca Islands tour.